"Don't look! ", "Move! ", "Normal citizens disperse!". The phrases policemen repeat over the megaphone, as they advance among demonstrators with plexiglass shields and water cannons, may have come from the pages of a sci-fi novel. "Normal citizens disperse! ", Ray Bradbury's firefighters may have said to the curious people looking at the books in flame. This, however, is not the imaginary world of Fahrenheit 451 or 1984, but contemporary Turkey. Here, "Don't look!" really is one of the slogans used by law enforcement, and recently, also the name of a website created by a group of activists. Since 2014, the portal bak.ma ("Don't look" in Turkish) seeks to do exactly the opposite – to let as many people as possible see what today's Turkey has become, challenging the regime's censorship and providing an alternative narrative to the one of President Erdoğan. "During the protests of Gezi Park, in 2013, we started to collect and store our videos, and a year later we launched bak.ma, which today contains over 2,000 hours of footage of protests, demonstrations, and events in Turkey from 1997 to date", says Clarisse (a fiction name), one of the founders of the project. Moroccan domain, server in Germany, hard disks spread across Europe and Turkey – the creators of this digital archive have had to think of various ways to avoid the repression of Ankara authorities, that two months ago went as far as to obscure Wikipedia pages. Convinced that "digital space is public space", bak.ma activists have collected nearly 1,300 videos, using a German open-source software (Pan.do/ra). They could count on the initial support of Indian colleagues at Pad.ma (Public Access Digital Media Archive) – a digital archive born in 2010 that provided Turkish activists with the first tips for uploading, storing, and editing videos online. "Our goal is not just to preserve the footage, but also to denounce police violence and to challenge the narrative created by the authorities", explains the young "media activist", as she identifies herself. Over 4 terabyte of data, sometimes coming from digitised videotapes, tell Erdoğan's rise from mayor of Istanbul to prime minister, president, and absolute leader of Turkey. Videos show water cannons hitting the citizens who were filming the marches, and policemen launching tear gas against demonstrators sitting on the ground. It is also possible to listen to interviews and debates. From India and Turkey, this model of "independent archiving" has spread to Egypt, Syria, Ukraine, and the United States – forming a "platform open to all" and "a living archive", say the activists, "because it is not about remembering the past, but creating a space to talk about the present". A space that in Turkey, however, is becoming more and more restricted. "The protests of Gezi Park made the regime understand the power of footage and the media, and now filming is getting harder", says Clarisse. "Anyone who films a demonstration can be apprehended and tortured, and their phone or camera taken away". 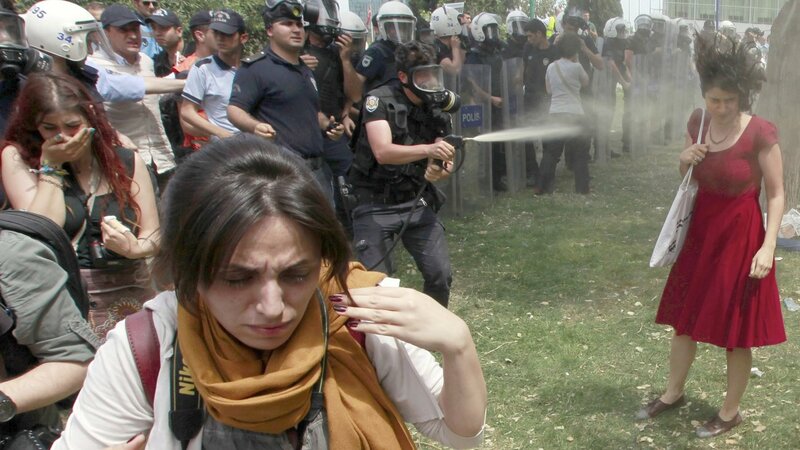 In spring 2013, a protest begun in order to stop the destruction of Gezi park in Istanbul became a national movement after brutal police intervention (8 victims and over 8,000 wounded). Since then, freedom of expression has been shrinking, in particular after the failed coup d'état of summer 2016. In one year's time, several waves of arrests and layoffs targeted tens of thousands of people. At the end of May 2017, 159 journalists were in jail, like 50,000 people considered close to the Gülenist movement (accused by the government of orchestrating the attempted coup), while 150,000 between judges, teachers, police agents, or state officials had been suspended or fired. For the activists of bak.ma, therefore, the danger is not theoretical. "A friend of mine was arrested less than a month ago while filming a protest. He was in custody for a few days, then they put him in jail. He doesn't know yet when he can go to court", continues Clarisse, who has made independent archiving the subject of her doctoral research. Including videos from cities with Kurdish majority, thus allowing to circulate the images of Kurdish protests and the harsh repression they face, bak.ma challenges another tenet of Erdoğan's propaganda – the one seeking to divide Turks and Kurds. "If movements and opposition parties can create a mass reaction, we can still change things in Turkey", Clarisse confidently says. For the time being, this activist from Ankara remains optimistic, explains that she is not afraid, and assures that she will continue to travel abroad to present her digital archive project. When asked about the name bak.ma, she reads an excerpt by writer Ulus Baker, that inspired her and her fellow activists. "'Normal citizens disperse'... This police announcement could be heard in downtown Ankara. Non-normal citizens must have been those surrounded by agents and means ready to shoot water. The state's wish was certainly to make them disappear, disperse them as soon as possible" (Ölüm Orucu – Notlar, 1996).